Historic Sleeping Bear docents are friendly, outgoing individuals who love the pioneer heritage within Sleeping Bear Dunes National Lakeshore. They serve primarily at the Port Oneida Farms Heritage Center where visitors take a self-guided tour. They familiarize themselves with the history, facilitate the visit, answer questions, and do research. They also work at the Port Oneida Fair, are responsible for sale items in the store, and serve as wonderful ambassadors for what we do! 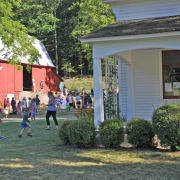 In addition, we have volunteers that want to get out on the landscape and give guided tours of the historic buildings and the farm life of these early settlers either via auto tours, bike tours, or narrating our horse and wagon tours. Tours by car and bike are 1.5 to 2 hours, horse and wagon tours are 1 hour. Docents - 3 hour shifts - 11 am - 2; and 2 - 5 pm with a minimum of two times per month between June and mid-October.